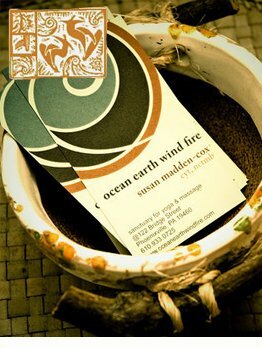 Bodywork - ocean earth wind fire : Sanctuary for Yoga, Massage & Whole Living : Phoenixville, PA. ocean earth wind fire : Sanctuary for Yoga, Massage & Whole Living : Phoenixville, PA.
Mary Edmonds and Susan Madden-Cox would like more and more people to experience our healing work, to experience a deeply felt understanding of what quality therapy is all about. Massage Therapy and Bodywork are no longer considered a luxury; they offer exceedingly beneficial health benefits that enhance well-being and immune function. Pain management, stress reduction and energy enhancement are important bi-products. We have a very comfortable center here that feels like home and promotes all kinds of avenues to healthy living. Bodywork is available Monday through Saturday by appointment. We currently have two gifted and professional therapists on staff. Our expertise encompasses Therapeutic Massage, Swedish Massage, Myofacial Release, Cranio-Sacral Therapy and Reiki! Please stop in soon for a visit and to schedule an appointment! Eight things I Learned from 50 Naked People.